Last week we spoke of bacteria, a major contributor to biofilms. What are biofilms and why do microbes make them? How is human health impacted by this mechanism of microbial life? Why do my teeth feel so fuzzy? Let’s learn to be scientifically conversational. 1) What are microbes? Why do they make biofilms? a. What is a bacterium? Microscopic, single-celled organisms. They do not have different internal compartments like Eukaryotic cells (human cells, plant cells, yeast cells, for example). They have a cell wall of some thickness, unlike human cells. They can be found in all manners of locations (mountains, oceans, inside of animals, frozen in ice, just about everywhere). c. What is a biofilm? A paper from 2002 by Rodney Donlan (CDC head of the biofil laboratory at the Centers for Disease Control and Prevention) was entitled “Biofilms: Microbial Life on Surfaces”. To you and I, they may be more easily represented by the slimy-mats that cover rocks in a stream or a river. They’re communities full of microbes and typically are complex mixtures of fungi, algae, yeasts, protozoa, or other microorganisms (though single biofilm mats can form from simply bacteria). The structural component to all of this madness is given by things called “extracellular polymeric substances” (which are chemically dissimilar and have resulted in various publications defining their makeup; think of it as a house for the microbes that live in the biofilm) and can result in biofilms microns in thickness to inches thick. Biofilms can impact fundamental environmental conditions like nutrient availability, spacial availability, and oxygen availability. d. Do all bacteria make biofilms? Unclear; there is a wealth of different types of bacteria in our world (likely 1 trillion microbes, 99.999 percent undiscovered or unculturable). It seems as if most bacterial species are willing to settle down and form biofilms if offered the chance or a long enough period of time. Still, there are bacteria that this is unknown for; planktonic types that live in the free, open ocean. e. What is the process of formation of a biofilm? There are characteristics that are important to start a biofilm; the surface might need to be rougher (more surface area) or of a particular type (hydrophobicity). The cells themselves dictate how well they stick to each other. This defines the process of attachment where bacteria adsorp to both the surface and each other. 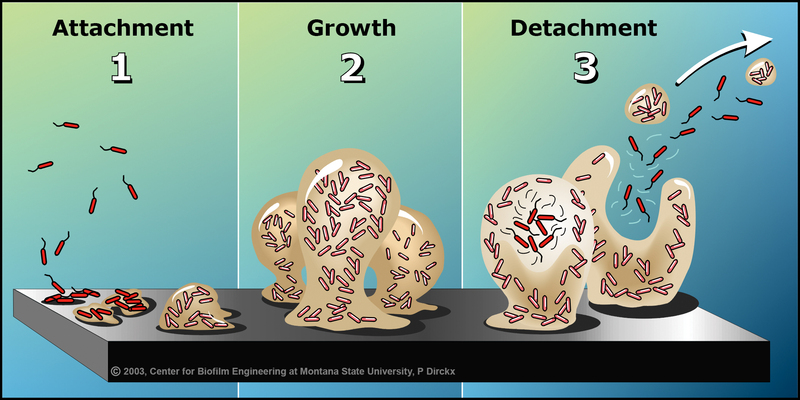 Growth of this biofilm continues by replication, which could be faster or slower depending on the availability of nutrients. These cells can or will begin using entirely different sets of genes because of the signaling from cell to cell and the nutrients available. As this process continues, further colonizing cells from the liquid surrounds can bind and attach. This can be dependent on what kind of molecules are being expressed in the first place. Individual members can become detached from a multitude of factors including erosion, human intervention, predatory grazing, abrasion, or starvation. Those detached members may start another biofilm elsewhere. i. Defense: Biofilms are resistant to physical forces (shear forces of liquids in environments like lakes or blood). Harder for bacteria to be “eaten” by the body or environmental predators. ii. Colonization: Once again, favorable environments are required for the best fitness of an organism. iii. Community: Some researchers go as far to imply that we should consider biofilms multicellular organisms and that biofilms exhibit cooperative, unselfish behavior. Much of this is purely philosophical but research is being done to model cooperativity between bacterial and microbial species. Gene expression can become heterogenous (division of labor) for metabolism and beyond, for example. Genes can be transferred in these populations, leading to antibiotic resistance and greater fitness of the population as a whole. iv. Default mode of growth: The lab does not mimic how bacteria live in the greater world around us; proper substrate and nutrient conditions may more accurately show how these organisms live. i. Mechanisms to prevent biofilms in medical equipment: Materials that prevent initial attachment (material sciences); preventing bacteria from being able to communicate to know they could form a biofilm; pursuing greater asepsis (Lawson Tait, episode 11, totally sterile environments); designing molecules or proteins to degrade the biofilm matrix. a. Quorum sensing: Originally a term to use for a committee when enough members are present to legally take action; quorum sensing is often used to describe Vibrio fischeri which produce light at sufficient populations. There are quorum sensing opportunities for other bacteria, like to produce toxins when at a certain population, to protect themselves. These chemical molecules that are used to do this communication are kept at high concentrations because of the sticky matrix that the biofilm provides. i. "The number of these animalcules in the scurf of a man's teeth are so many that I believe they exceed the number of men in a kingdom." Curioscity is a member of MicrobeTV, an independent podcast network for people who are interested in the sciences. Our shows are about science: viruses, microbes, parasites, evolution, urban agriculture, communication, and engineering.